The press has been spilling a lot of ink about the Tesla Model 3 production delays. Model 3 was scheduled to go to 5,000 vehicles produced per week by the end of 2017, but today, due to production bottlenecks, they are far from this goal and Tesla has conceded that the 5,000 units per week goal will not happen until March of 2018. This delay has been billed as a major failure by many analysts and many in the media. On this news, Tesla's stock price was punished, dropping from a high of $360 on October 18th down to $299 on November 2nd (full disclosure, I am long TSLA). The "failure" proclamations from analysts and media made me wonder how Tesla has done compared to other car companies. Yes, Tesla has failed to meet their own lofty goals, but how does their Model 3 rollout compare to other car companies' launch of a new vehicle? Let's see. Honda began shipping their new Clarity EV in July 2017, the same month as Tesla began delivering Model 3. Tesla has delivered more than twice as many Model 3 units compared to the Clarity EV. Honda is not new to the car game, yet Tesla is outpacing them. I'll let you speculate as to why Honda's electric offering had been anemic. Similarly, Volvo started shipping their new XC60 PHEV in July too and Tesla has shipped about 100 more of their new car than Volvo. The Cadillac CT6 PHV began shipping 3 months before Model 3 and yet Model 3 has out-sold this car by a factor of 2. The BMW i8 has been shipping all year and Tesla has already delivered more Model 3s. There are more Model 3s on the roads than i8s. I have not seen "failure" stories about every (or any) one of the vehicles that are below Model 3 on this list. The "failure" on Tesla's part seems to be having high demanding self-expectations. Looking back, for a previous breakthrough car that changed the way many people drive, the Toyota Prius comes to mind. In the Prius' first year of delivery in their home country, they delivered about 300 cars. Tesla has already delivered 367 Model 3s through Q3 of this year, with more coming in November and December. Tesla Model 3 year 1 will likely double that of Prius' introduction year. In the Prius' first full year of production, they delivered 17,700 cars. Model 3's first full year (2018) will be significantly higher. It wasn't until the Prius' 7th full year of production that they were over 100,000 delivered annually. We should see more than 100,000 Model 3 in its first full year of production. Model 3's ramp to 100,000 will be 6 years faster than Prius'. 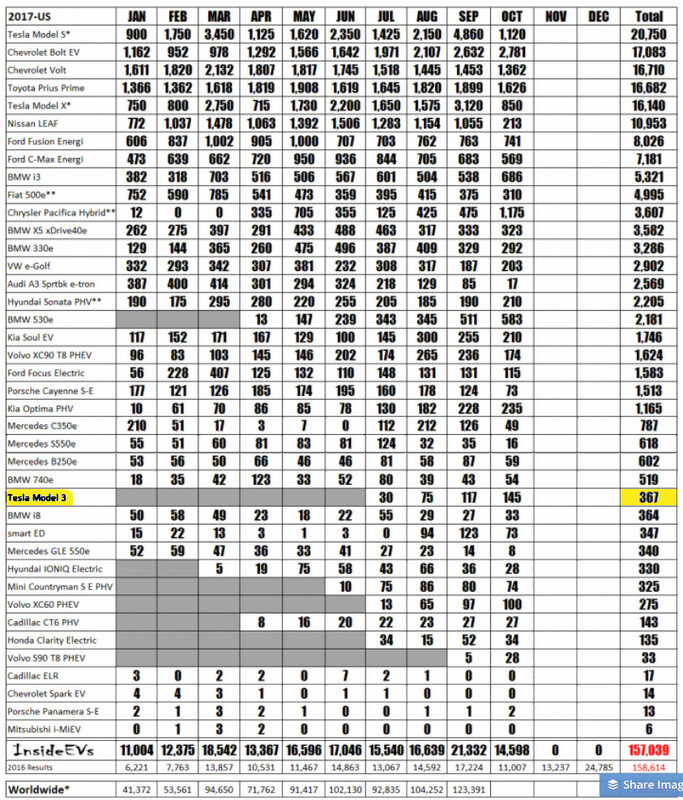 In the Chevy Volt's first full year of production, GM delivered 7,671 cars. Similarly, in the Nissan Leaf's first year of full production, they delivered 9,674 vehicles. Model 3's first year of full production will be an order of magnitude larger than these. Tesla has not delivered to their own high expectations for Model 3's ramp. Certainly, the 400,000+ people on the waiting list would love to have their cars sooner rather than later. But compared to the plug-in offerings from BMW, Honda, and Volvo, Tesla is delivering. Comparing Model 3 to the early years of the Prius, Leaf, and Volt, Tesla is delivering. For the analysts that want Tesla to stop overcommitting and underdelivering, I say there are other companies that make very small commitments, you might want to invest in them. I would rather do business with, and invest in, a company that promises the moon and delivers greatness; rather than one that makes and meets pathetically small goals. Looking at all of the plug-in cars on the scorecard list above, there is no question in my mind that Model 3 will be number 1, with a big lead on the pack, on the Plug-in Scorecard for 2018. Tesla may be late on their March goal for 5,000 per week too, but they only need to get to 1,000 vehicles per week to dominate the scorecard.